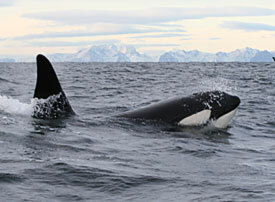 other characteristics: The orca might be better known as killerwhale. But until now there are no known situations, that a freeliving orca had killed a person. The most significant outward characteristics are the white marks around the eyes and on the belly and the big fin which gave it the german name "Schwertwal" (swordwhale). The males' fin can be up to 6'6'' (2m).